Properties in Province of Girona average 4.4 out of 5 stars. Villa Riells Mar for 8 with a private pool only 350m from beach and commerces. Property 2: Villa Riells Mar for 8 with a private pool only 350m from beach and commerces. Property 13: Magnificent villa with private pool. Pretty villa with private pool, close to the sea. Property 14: Pretty villa with private pool, close to the sea. Beautiful Catalan villa face sea. Ds feet sand 1h BCN. Property 15: Beautiful Catalan villa face sea. Ds feet sand 1h BCN. 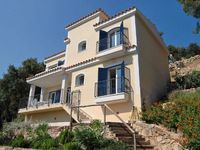 Property 25: Club Villamar - Wonderful villa in Lloret de Mar with private swimming pool and beautiful view. Property 27: PIRINEU: HOUSE IN A QUIET AREA WITH A LARGE GARDEN. 12 metre private pool plus sea, mountain & castle views. Beautiful modern villa! Property 29: 12 metre private pool plus sea, mountain & castle views. Beautiful modern villa! Pretty traditional villa full of charm and 3min from the beach! Property 31: Pretty traditional villa full of charm and 3min from the beach! Big House near the beach and shops Riells- L'Escala .Any year. 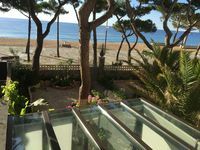 Property 32: Big House near the beach and shops Riells- L'Escala .Any year. Villa Sonni sleeps 6 people. It has a pool, panorama, air conditioning and WiFi. Property 33: Villa Sonni sleeps 6 people. It has a pool, panorama, air conditioning and WiFi. Property 44: New villa 3 faces 500 meters from the beach in quiet area. Summer house with private pool and garden. Property 45: Summer house with private pool and garden. Spectacular! The perfect location to relax with easy access to fun &amp; food! We had a wonderful time relaxing in this well-equipped home and loved that we could walk out the gate and be in the sand on the sea. The home was very clean and comfortable. Parking at the rear was a fantastic bonus. Dining and entertainment was close by and it was a five minute walk up to the main &quot;strip&quot;; grocery stores, bakery, and meat markets were also an easy walk - less than 10 minutes. Our host was available and responsive to answer any questions. Highly recommend!